The gloom of this dull, damp, miserable winter was relieved this week when I received an unexpected gift through the post – a recently-published book on natural dyeing, co-authored by Eva Lambert and Tracy Kendall. I have known Eva for many years and visited her several times in her studio and dye-workshop on the Isle of Skye. She has a wealth of practical experience to share, as she has been running her own business, Shilasdair, for many years, selling her naturally-dyed yarns and beautiful garments made from them. Tracy Kendall, whom I met several years ago when we were both demonstrating dyeing at a conference on Mediaeval Dyes, is a lecturer at Central Saint Martins College in London and she also has her own design studio producing hand silk-screened wallpapers. 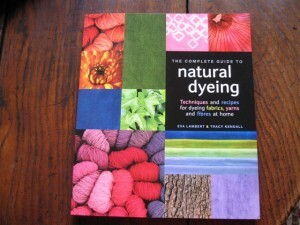 The book, “The Complete Guide to Natural Dyeing – Techniques and recipes for dyeing fabrics, yarns and fibres at home”, is a lavishly illustrated, full colour paperback, published by Search Press and selling at £12.99. It covers the basics of mordanting and dyeing, and the yarn section, written by Eva Lambert, also includes top-dyeing, tie-dyeing and random dyeing. The fabric section, written by Tracy Kendall, covers several fabric-patterning techniques, including various resist-dyeing methods, such as folding, clamping and batik. The dyeing sections cover collecting and preparing dyestuffs and give recipes for using a wide range of dyes, including classic dyes, such as madder, cochineal, weld and logwood, plus a section on indigo dyeing. 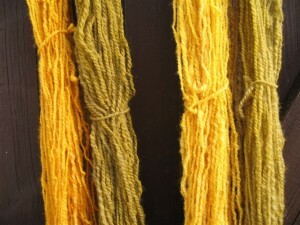 As a dyer, I am always interested in the methods and techniques used by other dyers. Some of the recipes in this book, especially those for mordanting fibres, differ from those I use myself and I found the sections on colour and patterns interesting. All in all, this book is a delight, full of useful techniques and recipes, with luscious colour on every page. I haven’t used onion skins in the dyepot for several years, although I still always save them, and I keep the red onion skins separately from the brown ones, as they often give slightly different shades in the dyepot. Whilst rummaging through some of the boxes in my workshop recently, I unearthed several bags of onion skins, so last week I decided to use some of them to dye some skeins of wool. Onion skins will dye quite readily without the use of a mordant but for the strongest, most vivid colours I use an alum mordant. However, if you use unmordanted fibres, the use of an alkaline modifier after dyeing will increase the depth and brilliance of the shades. For very deep colours you may need to use 100% weight of onion skins to weight of fibres, but I usually find that 50% gives sufficient depth and brilliance. 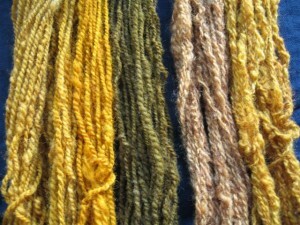 I then made a dyebath using some red onion skins. In the past, I have sometimes achieved interesting green colours from red onion skins but this time the colours obtained were not as bright as I had hoped they would be, probably because I only had a handful of skins. The photo below shows from left to right: alum mordant, alum mordant + alkali, alum mordant + iron, no mordant, no mordant + alkali. Afterwards, I wondered why it had taken me so long to get round to dyeing with onion skins again, as they really do give lovely colours, even if their light-fastness is limited. jennydean.co.uk on Chickweed as mordant? Louisa on Chickweed as mordant? neki rivera on Chickweed as mordant? Mary on Chickweed as mordant?